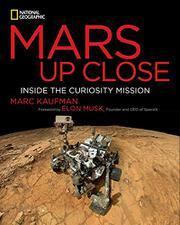 A vibrant telling, amplified by striking images and photographs, of the Curiosity mission to Mars. This is a National Geographic Society endeavor, and the society has a reputation for head-turning, worldview-shaking products; this one doesn’t disappoint. In clear language, science writer and former Washington Post correspondent Kaufman (First Contact: Scientific Breakthroughs in the Hunt for Life Beyond Earth, 2011) follows the scientific aspects of the project, including chemistry, mineralogy, climatology and geology, and he examines the important search for clear evidence of water through the probing of sedimentary layers, alluvial fans and rounded stones. As the Curiosity rover dutifully goes about its tasks, Kaufman follows the rover’s progress like a play-by-play announcer. The scientists, a number of whom are profiled in vest-pocket biographies, all pursue their specific jobs with the fervor of zealots. Kaufman also provides a history of the two previous rover missions to Mars, which seem primitive compared to the clarity of the Curiosity’s relays, and there are a few dramas, which get milked for suspense—particularly when the main computer starts to behave like it has a mind of its own. Stealing the show, as is often the case when the NGS is at the controls, are the photographs sent back by Curiosity. Sometimes, the colors are enhanced for scientific purposes, but for the most part, readers witness the actual scenes, which are at once recognizable and utterly alien. The light is strangely different, the geology so primal it feels elemental, and the sky like something out of 1950s science fiction. It is just what you want Mars to be: weird. Elon Musk, founder of Tesla Motors and SpaceX, provides the foreword. A totally gratifying account of the Curiosity mission.